The company is looking for top-flight professionals with an interdisciplinary approach and global thinking. 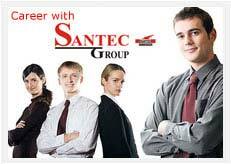 If you seek a career that challenges and inspires you, consider Santec. Working with Santec gives you an opportunity to explore and map out a dynamic career path tailored to your personal growth. The company invites talented team players with an open mind, in-depth knowledge and a willingness to work internationally. Extraordinary opportunities for growth: The company offers position that allows you to collaborate across technologies and continents. New horizons, ongoing education : A wealth of diversity in culture, training, knowledge and experience gives employees opportunities to learn and expand their horizons. Leading-edge innovation: Innovation isnt just a buzz word at Santec; its one of the pillars on which our entire business operation is based.